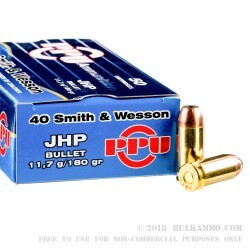 A cheap price for those that want to shoot jacketed hollow points at the range, for practice, or for those that want to shoot the same ammunition out of their defensive guns as they do at the range, eliminating a bunch of different boxes on the shelf. This is a pretty good candidate for the single variant shooter, who just likes the simplicity of having a single round for everything in a given caliber. 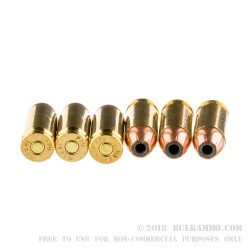 The performance of the hollow point projectile is adequate for the shooter who needs legitimate performance form a personal defense round, and is still priced well enough to make range shooting a relatively affordable practice. Prvi Partizan is one of only a handful of European based ammunition manufacturers that have the capabilities that they do and could easily be counted in the top 5 of all European producers of ammunition without a lot of argument. They are also gaining traction, and already have a very good reputation in the USA market because of their ability to offer top tier ammunition for the shooting public at legitimately competitive prices. 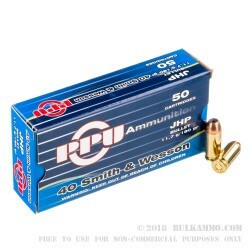 This is a 180 grain JHP load that offers very solid performance for the majority of mainstream handguns on the market, or for carbines that shoot the .40 S&W. I've only shot 100 rounds of this but it far exceeded expectations. Accurate and not nearly as dirty as some other PPU rounds. Good quality brass, no hiccups and, maybe just me, I like the rack that comes with it for big bulk bags. 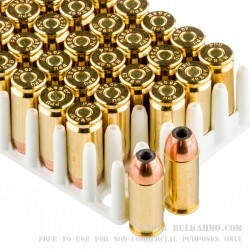 Compared to some Remington "Ultimate Defense" I felt like this did more to my block targets.